June 2012 -- Baloney Books® is excited to announce the launch of the Spanish Editions! Each story in our series has been translated by two Spanish teachers. These books are perfect for the English language speaker who wants to reinforce basic Spanish lessons or the native Spanish speaker who wants an enjoyable easy reader tale. The fully translated series is available at our online Spanish Book Store! May 7, 2012 -- Thank you to the Maryland State Department of Education for welcoming Baloney Books® as a vendor at their Employee Appreciation Week Fair on May 7, 2012. It was wonderful meeting the great employees who support Maryland’s public education system and especially event coordinator Heidi S. Toll. Proceeds from the event will support a charity selected by the Superintendent. November 16, 2011 -- Author Lisa Douglass visited 5th graders at Woodmore Elementary School on their Career Day to give students insight on the parallels between software engineering and writing. Oh, you didn't know that Lisa Douglass is also an engineer? Well, check out her biography linked here and find out how building software is similar to constructing a book! October 29, 2011 � The Arts & Letters Committee of the Baltimore Metropolitan Alumnae Chapter of Delta Sigma Theta, Inc. welcomed Baltimore Authors Lisa Douglass and Shontel Adams as panelists for their Writer�s Workshop, held at the Woodlawn Branch of the Baltimore County Public Library. 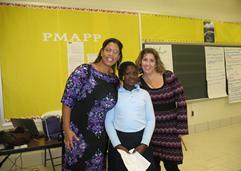 The interactive discussion offered valuable insights to the writing and publishing process. Many thanks to Sharon Webb, M.Ed. for the invitation! May 3, 2011 � Orems Elementary School welcomed Baloney Books� author Lisa Douglass to Family Reading and Art Night, sponsored in part by a Crayola� grant. Students enjoyed meeting a local author, participating in a hands-on exercise that reinforced the writing process, and listening to one of the Baloney tales. They then participated in a bookmaking project and showed off their own published literary works! It was a terrific program. Many thanks to Reading Specialist Ms. Doyle for the invitation. "Thank you once again for visiting our school last Tuesday evening. The feedback we received from our parents and students was very positive. Thank you for taking the time to share your knowledge of the writing process with our students in an engaging way. We truly enjoyed having you be a part of our Family Reading and Art Night. Best wishes for future publications in the Baloney Books series!" 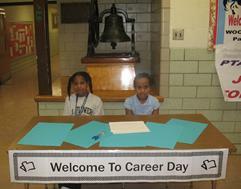 November 5, 2010 -- Career Day! Had such a wonderful time visiting the students at Woodmore Elementary School in Mitchellville, Maryland! The students were amazing. I shared details on my career path and how I applied my skill as a software engineer to constructing books for children. I was so impressed by how each student played a critical role in helping to coordinate the event. Thanks to School Counselor Susan Harris for the invitation! October 9, 2010 -- Baloney Books� donated 30 1st and 2nd edition books to Sesego Cares through the Robert and Claire Peter Foundation on Saturday, October 9th to make a difference in the lives of vulnerable people in South Africa through education. 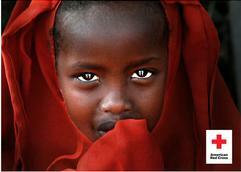 Click here to find out how you can �Lend a Hand and Change a Life� today through giving. October 2, 2010 -- Author Lisa Douglass visits The Sunflowers, a club of young readers, on Saturday, October 2, 2010. The girls defined vocabulary, read Gwendolyn BALONEY Lomax Goes on a Date, and worked through a hands-on lesson on the purpose of planning and order of activities. September 24-26, 2010 -- The Commission on Arts and Letters of Delta Sigma Theta Sorority, Incorporated (DST) develops programming to benefit the African-American community through increasing awareness and participation in the arts. The Baltimore Metropolitan Alumnae Chapter (BMAC) of DST teamed with Baloney Books, LLC to showcase local children�s book author Lisa Douglass at the Baltimore Book Festival. This year, the Arts and Letters Committee of the BMAC DST designed an afternoon reading program for children � including storytelling and hands-on projects � to enhance their growth and development. Celebrating its 15th anniversary, the Baltimore Book Festival welcomes authors, illustrators, and lovers of literature. May 2, 2010 -- Baloney Books� participated in the Alpha Kappa Alpha 30th Annual Scholarship Benefit Luncheon and Fashion Show as a vendor. This affair is sponsored by The Pearl Foundation, Incorporated of Iota Lambda Omega Chapter. 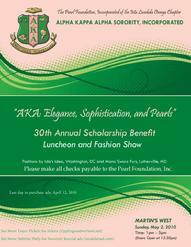 All proceeds from this year's event, themed "AKA: Elegance, Sophistication, and Pearls," will provide scholarships to deserving youth who will be starting college this fall. April 29, 2010 -- Fountain Green Elementary welcomed Baloney Books� author Lisa Douglass, who delivered an exciting presentation on the importance of Writing Revision using Play-Doh! Students enjoyed listening to one of the Baloney tales and were inspired to tell tales of their own. "I just wanted to let you know EVERYONE LOVED your presentation. You are a natural with children. My students are still bragging, in front of the other 4th and 5th graders, about meeting a local author. This was a wonderful experience for us. I am THRILLED beyond words that you have become "the hot topic" around school. All of the aides that were in my room have shared how impressed they are with you. Thank you so much for sharing your talents, time and "sunshine spirit" with my school!" February 23, 2010 -- Terrific News! Baloney Books� was invited to present a Lunch & Learn session for the Winston-Salem/Forsyth County Schools Title I Program. We are happy to announce that the Baloney series was approved for use in the W-S/FCS district! Baloney Books� meets the Competency Goals & Objectives of the North Carolina Standard Course of Study, which includes curriculum that should be made available to every child in North Carolina�s public schools. While Title I does not endorse any program or vendor, approval for use by elementary schools within the district means that Baloney Books� is deemed a product that will meet the needs of struggling learners. January 15, 2010 -- Baloney Books� made a $100 donation to the American Red Cross Haiti Relief and Development fund. The American Red Cross is working with its partners in the global Red Cross and Red Crescent network, including the Haitian Red Cross, and other partners to assist those affected by the series of earthquakes that devastated Haiti on January 12th. Assistance provided may include sending relief supplies, mobilizing relief workers and providing financial resources and recovery. Additionally, Baloney Books� will donate 25% of the final sale price of any book sold at the Baloney Book Store through February 28, 2010 to the American Red Cross Haiti Relief and Development fund. 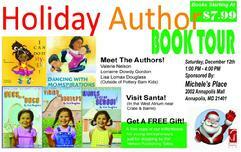 December 12, 2009 -- HOLIDAY AUTHOR BOOK TOUR! Social Studies, Language Arts, and Mathematics were highlighted in the books of three independently published authors at this year�s Holiday Author Book Tour. Lisa Douglass, Lorraine Dowdy Gordon, and Lori Nelson showcased their books at Annapolis Mall on December 12, 2009. Baloney Books� have a strong social science theme and offer stories that help to reinforce basic instructional and performance objectives of the Social Studies curriculum. Dancing with Momspirations teaches children the power of positive language and how it affects the way they think and behave. Hillary�s BIG Business Adventure introduces young children to basic business and financial concepts. 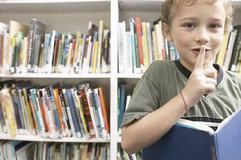 The books complimented each other wonderfully, offering a combined reinforcement to the elementary curriculum. → Click here to view pictures from the event! 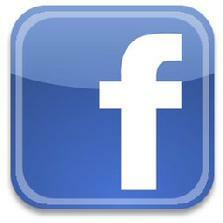 November 13, 2009 -- Baloney Books� celebrates its 100th Facebook Fan, LAUREN! To celebrate, Baloney Books� is offering 10% off all purchases through November 22, 2009 and our 100th Fan will receive a complimentary set of Baloney Books�! The series makes a great HOLIDAY GIFT! Log on to the Baloney Book Store TODAY and take advantage of the savings! November 7, 2009 -- The Sunflowers, a part of God's Reading Stars Foundation, Inc., welcomed Baloney Books� to their monthly Book Club meeting. We had lots of fun learning new vocabulary words and discussing lessons on rules, rights, and responsibilities. The girls were bright, excited, and creative...it was a room full of STARS! 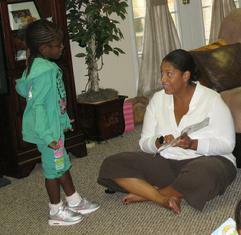 November 1, 2009 -- Single Parent 101 Magazine. Baloney Books� is featured in the November/December issue of Single Parent 101 Magazine. 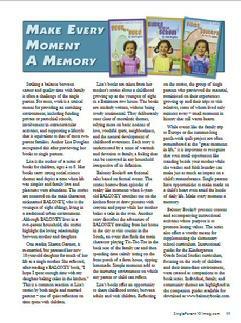 The article, Make Every Moment A Memory, is an inspiring call to action for all parents. ←Check out the article by clicking the image to the left! September 28, 2009 -- BALTIMORE BOOK FESTIVAL 2009. Parents, teachers, children, and other avid readers of children's literature met Author Lisa Douglass and got signed copies of her books at the 14th annual Baltimore Book Festival, held at Mount Vernon Place in Baltimore, September 25 - 27, 2009. September 13, 2009 -- Author Lisa Douglass was an exhibitor at the Fourth Annual Park Your Arts Sidewalk Arts & Music Festival held at the historic Prince George's County Courthouse on Main Street in Upper Marlboro, Maryland. Park Your Arts is a celebration of the historic Upper Marlboro community that seeks to promote the rejuvenation of the local arts scene. The festival is sponsored by the Friends of the Upper Marlboro Library. 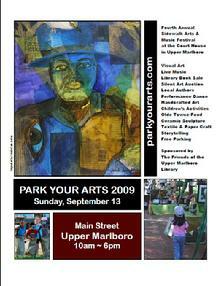 All proceeds from Park Your Arts support the Friends' effort to augment the programs offered by the Upper Marlboro Library. 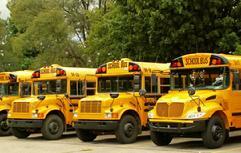 September 5, 2009 -- ATTENTION: Parents, Teachers, and Children! Baloney Books� will present a 30-minute educational program each Saturday morning, starting on September 5, 2009 at 7:30 AM on the historic WOL-AM Radio (1450), Washington, DC. The broadcast is for kindergarteners, first, second, and third graders�and parents, of course! In each broadcast we�ll read a story aloud, talk about vocabulary, and chat about some of the themes in the story that relate to what kids are learning in school. Teachers, if you are looking for a way to extend the learning experience and provide an extracurricular support to your students, make sure you assign this broadcast as homework. Each program will cover social studies topics like rules, rights, responsibilities, geography, economics, time, and sequential ordering of activities. 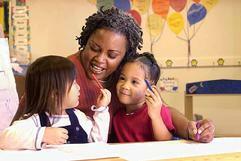 We�ll also touch on language arts skills. The program will be offered LIVE on the web through streaming internet radio, so if you are outside of the broadcast region, don�t worry�the Baloney Books� Reading Room is available worldwide! Log on to WOLDCNews.com and LISTEN LIVE! August 16, 2009 -- Author Lisa Douglass was an exhibitor at the 19th Annual Stone Soul Picnic held at the RFK Stadium Grounds in Washington, DC on August 15, 2009 from 12:00 PM to 8:00 PM. Stone Soul Picnic is an annual FREE event sponsored by Radio One and open to the public. Stone Soul Picnic offers entertainment for the entire family, including eight hours of main stage performances including national and local talent. June 25, 2009 � The Baloney Books� series will be added to the Baltimore County Public Library�s (BCPL) Local Author Collection housed at the Towson branch. All titles in the series will be added to the library catalog and available for circulation to any BCPL customer. June 15, 2009 � Baloney Books� are now fully illustrated! Spot sketches have been added to each book in the series. Second edition books are available for purchase at the Baloney Book Store. 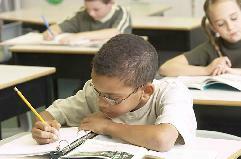 June 7, 2009 � Baloney Books� offers instructional guides for the Kindergarten Grade Social Studies curriculum, focusing on the study of children and their immediate environment. Individual, family, and community themes are highlighted in the companion guides for the book series and are available for download on www.BaloneyBooks.com. Content for the Instructional Guides developed by Baloney Books� is based on the Maryland State Department of Education Grade K Voluntary State Curriculum (VSC). Baloney Books� Instructional Guides are provided as a courtesy to teachers seeking supplemental material to support their coursework in core subject areas. PLEASE NOTE: Baloney Books� Instructional Guides are provided as a courtesy and in no way suggests approval, sponsorship, endorsement by, or affiliation with the Maryland State Department of Education. 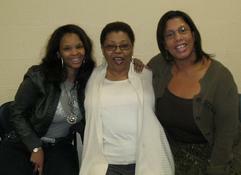 April 23, 2009 � Author Lisa Douglass is featured in the Black Pearls Magazine, newsletter, and community blog. Black Pearls Magazine is a free digital magazine committed to inspire, encourage and empower an international group of readers. Their mission is to provide information that is essential, enlightening and entertaining. Please take a moment and visit Black Pearls Magazine to view the interview. Baloney Books� Makes its Debut on March 7, 2009!